With 23,000 deaths in the U.S. each year attributed to infections that are antibiotic resistant, and increasing interest from consumers, food companies and restaurants in the use of antibiotics in livestock production, today’s livestock producers are facing pressures to reduce antibiotic use on their farms. However, antibiotics remain a key element of treatment protocols for producers. Curt and Diane Johnson are one of many producers who are using a tool from Pipestone Veterinary Services, called Pipestone Antibiotic Resistance Tracker (PART) to record and monitor antibiotic resistance and antibiotic usage, then make changes that benefit animal health and their operation’s bottom line. The Johnsons have been farming south of Pipestone, Minnesota, since 1994. 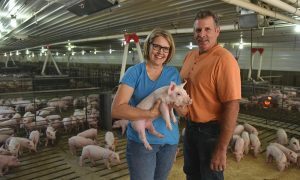 They are owners in the Fox Run sow farm and finish about 20,000 pigs each year. They also raise corn, soybeans and stock cows. They began using the Pipestone Antibiotic Resistance Tracker (PART) tool when it was introduced in 2017. PART is a web-based system that allows producers the ability to record antibiotic purchases and usage, then benchmark their operation against others. Participants receive regular updates and consult with their Pipestone veterinarian on a regular basis to review usage and performance. The system tracks usage by purchase and amount across a total farm and to the site level. It records both the amount and type of antimicrobial used, including injectables, water soluble and feed grade products, said Joseph Yaros, DVM, staff veterinarian at Pipestone. Another important element of the program is tracking usage of antibiotics deemed important to human health. The ability to benchmark their operation with others in the PART system has also been valuable for the Johnsons. “We can see how we compare – on an anonymous basis – with everyone else in the PART system. It gives us an idea of where we stand and where we can make improvements,” said Curt. The data for producers who participate in the program is kept confidential and will not be shared. The ability to Record, Review and Respond for the responsible use of antibiotics is now an important element of the Johnson’s approach to animal care. They also see it as key to sharing information about raising pigs and livestock with consumers. Brad Greenway says his farm’s use of antibiotics has decreased, but it’s not something he plans to take out of the toolbox anytime soon. Fact: Using antibiotics responsibly is an important part of the welfare of our animals, food safety, and sustainability. Science is an amazing tool that helps us to understand how AND WHY things work throughout the universe. Science uses standardized methodologies, a strict level of testing, and enforces repeatability. But science can be a difficult topic to communicate. Unfortunately, some try to make something look scientific to have the illusion of credibility. Take for example the new report by the NRDC on “How Top Restaurants Rate on Reducing Antibiotic Use in Their Meat Supply Chains”. When you first read the media coverage on this report, you get the impression that they either found antibiotics in the meat at 22 of the 25 burger restaurants they evaluated or they have intimate knowledge about how much antibiotics are being used at the farms sourcing these restaurants. But upon further review, this is not the case. It becomes clear that they are actually evaluating the written antibiotic POLICIES of each fast-food burger joint included in the report – with two receiving an A, one receiving a D-, all others receiving an F. When you dig into the 63 page report, you learn that the only two restaurants that received an A source beef raised without antibiotics. It quickly becomes apparent that a good grade is awarded to restaurants who support farms that do not use antibiotics. Truth: The meat that you purchase at a burger joint or your local grocery store are safe. All animals that receive any antibiotic treatment MUST go through a waiting period prior to being harvested for food to let the antibiotic leave their system. Truth: Unhealthy animals can carry more bacteria. Through responsible antibiotic use and keeping our animals healthy, there is less risk of bacteria contaminating our food. Truth: The farms that I have the privilege of working with taking antibiotic treatments seriously. Farmers and veterinarians are committed to using antibiotics responsibly. Using antibiotics responsibly means using antibiotics to treat animals if they are ill and to stop illnesses from spreading. Responsible antibiotic use is the right thing to do for the welfare of the animals in our care AND sustainability of a safe & wholesome food supply. Antibiotic resistance is real and so are the many scientific factors that play into the big picture of a safe food supply. As a mother and veterinarian, I love science – and I love sharing a good burger with my family! I urge you to PLEASE read to learn, listen to understand and don’t take media reports at a glance or half-truth headlines. Dig deep, seek to understand – American farmers are feeding you safely every day. If you have any questions regarding responsible antibiotic use please speak with your Pipestone veterinarian. 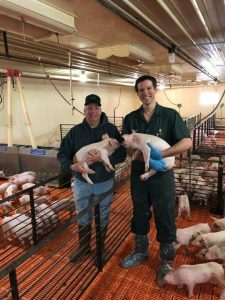 As popular headlines focus on the potential link between antibiotic resistance and usage of antibiotics in food animal production, it is more critical than ever for swine veterinarians and producers to work together to use antibiotics in the most effective and judicious ways possible. The use of antibiotic sensitivity information has become an increasingly valuable tool in developing treatment protocols for pigs. “For a long time, veterinarians have used antibiotic sensitivity assessments to assist in judging with which antibiotic would be effective in treating animals,” said Dr. Cameron Schmitt, Pipestone veterinarian. For example, he said, if a barn with 1,000 pigs is experiencing issues with respiratory disease, the veterinarian may order a sensitivity assessment on samples from a pig that has died or been euthanized. A diagnostic report takes three to five days to be completed and typically shows the sensitivity of the organism to appropriate antibiotics. A sensitivity assessment is conducted in a laboratory where a sample of bacteria from an infected animal is allowed to grow in a petri dish or test tube “broth” that contains an antibiotic. “If the organism grows, we know that it is resistant to the antibiotic. If it isn’t able to grow, the antibiotic is effective against that bacteria,” he said. Knowing which antibiotics the bacteria are sensitive to is a critical step in determining potential treatments, but understanding the pharmacology of each antibiotic option is also important. 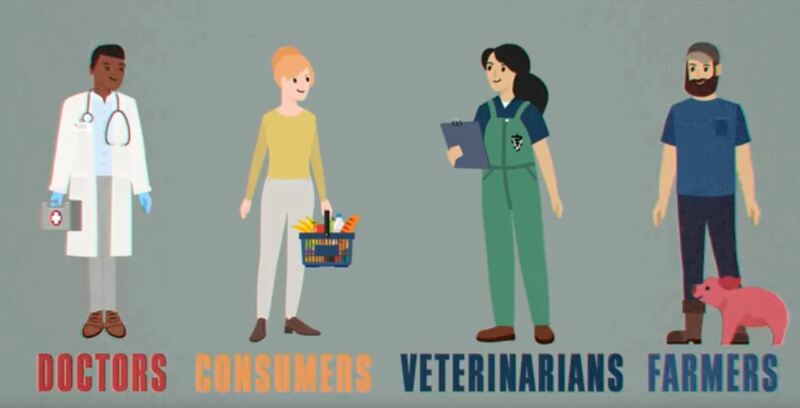 The combination of test results, animal and barn observations and understanding of how available antibiotic options will work, can provide a veterinarian and farmer with options to make the best decision for the health of the animals. 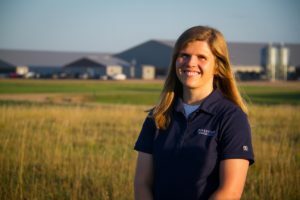 Veterinarians at Pipestone see potential for antibiotic sensitivity assessment results to provide information that will help not just on individual farms, but in identifying trends in antibiotic resistance on a much larger scale. The PART (Pipestone Antibiotic Resistance Tracker) program launched in 2017 is a first step in gathering important data. More than 180 subscribers representing 3.2 million pigs are currently tracking both purchase and usage of all types of antibiotic products including water soluble, feed additives and injectables. 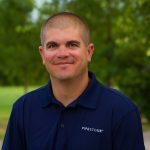 Gathering and analyzing data necessary to track usage and resistance trends is a significant undertaking. 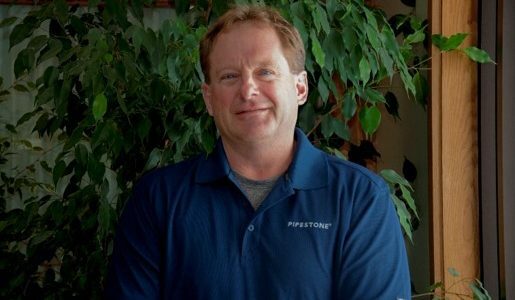 Dr. Schmitt said that Pipestone plans to compile and publish research findings with shareholders, as well as with academics and industry representatives. In the summer of 2016, Pipestone set forth the challenge to be global leaders in antimicrobial stewardship. As swine veterinarians, we feel a responsibility to lead the industry with science-driven decisions on how to manage the use of antimicrobials, track resistance, and make proactive changes to practices if increased resistance was shown. With that in mind, we crafted PART (Pipestone Antimicrobial Resistance Tracker), a tool to measure antibiotic use on farm, as well as to track antimicrobial resistance (AMR) across veterinary pathogens, over time. My role in this effort is a bit “out-of-the box”, as I tried to develop a means of how to measure pathogens of food safety and human health at the level of the farm. I got my inspiration from a group called NARMS, the National Antimicrobial Resistance Monitoring Service. NARMS is a federal organization, which measures the level of 4 specific bacteria, known to cause food-borne illness in people: E coli, Salmonella, Enterococcus, and Campylobacter. NARMS is composed of the CDC, which measures cases of food-borne illness in people, the FDA, which monitors the presence of select food-borne pathogens at the level of the meat case and the USDA, who measures these pathogens at the level of the harvest facility. No one in NARMS was measuring at the farm. I needed to use NARMS-standards on the farm as they were already accepted by the government and the national medical community. Unlike tracking AMR at the veterinary level, where you post 1-2 sick pigs out of 2400 and send a few samples to a lab, I wanted a more comprehensive, representative sample of the population and its environment. To help answer, we collaborated with the Veterinary and Biomedical Sciences Department and Food Safety Microbiology Laboratory at South Dakota State University to craft a protocol to sample both live animals prior to marketing and their environments. In addition, we mimicked the exact antimicrobial susceptibility panel used by NARMS, so we could start to track resistance patterns across the 4 bacteria. Now that we had a set of nationally-accepted standards and a validated sampling protocol we could go to work. I can’t thank everyone at SDSU enough for all their expertise and help with this important project! To make a long story short, our methods have proved to be accurate and repeatable, not only in swine environments but across alternative environments, such as human waste water treatment plants, playground dirt and companion animal facilities. We can routinely detect our 4 NARMS bacteria and determine their level of AMR. For third-party validation, we have also worked with Drs. Jonathan Frye and Charlene Jackson from the USDA-ARS lab in Athens, GA (who helped set up the original NARMS standards) to determine whether a report of resistance from the SDSU VDL is indicative of the presence of a resistance gene. In other words, if the lab says bacteria are “susceptible” or “resistant” to a specific antibiotic, is it true? Short answer= Yes! 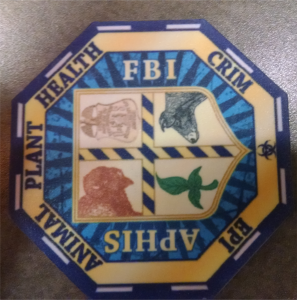 Whew…I realize this is a lot of information BUT I wanted to try to explain the degree of detail we put into the process of sampling swine environments and the collaboration we had with nationally recognized agencies. As we collect more information, I will keep you posted on what we are learning! Thanks for your support.